A quick thank you note for everyone who has given feedback & support on Monday’s announcement (I’m leaving the survey open so keep those answers coming!) Next week I’ll go into detail about my e-design services and also the future of this blog. I can’t wait to begin and share this new journey with you. Several of you were asking to learn more—your wish is my command! I’m not an expert in this field by any means—I actually just recently found out these companies existed, so I’ll share the extent of my knowledge (aka quick and to the point). 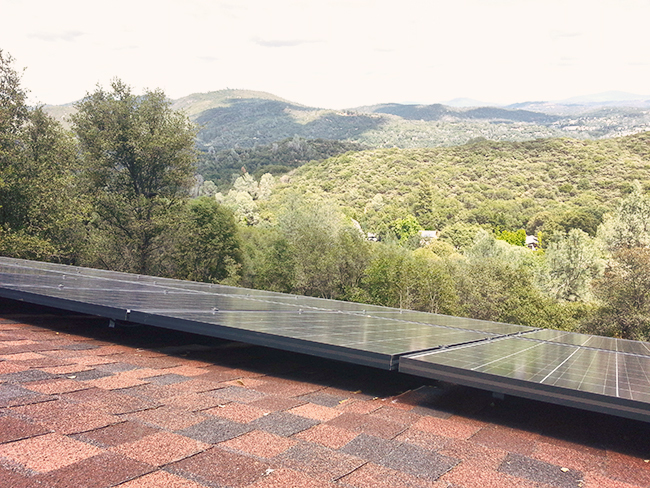 Last month we visited a new friends’ house and Brad and I noticed their solar panels and were curious about them. They’re not terribly common to see up here, and I had always falsely assumed that they were primarily used by wealthy and/or super environmentally conscious folks. So we were both quite surprised when our friend said they not only saved them money every month on electricity, but they were entirely free and there was zero work involved. I thought, “too good to be true—why doesn’t everyone have them?” Well, I’m assuming a lot of people are like we were and just didn’t know these companies are around. Here’s the jist of how it works. 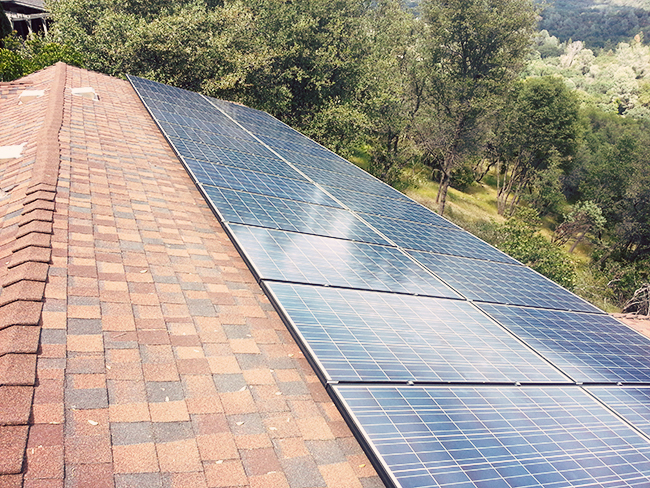 The solar company owns the panels and they take care of all of the evaluation, permits, installation and maintenance at no cost. Once installed, you start paying them for the energy it produces instead of your current electric co. (at a lower rate). Any excess energy they produce is bought back from your existing electric company in the form of a credit on your bill (ours is PG&E). When the panels are not producing (i.e. it’s dark outside) you just switch back over to your current electricity provider. This is all a completely automated process and you don’t have to do anything differently, aside from paying two separate (smaller) electric bills instead of one. And you’re using green power! 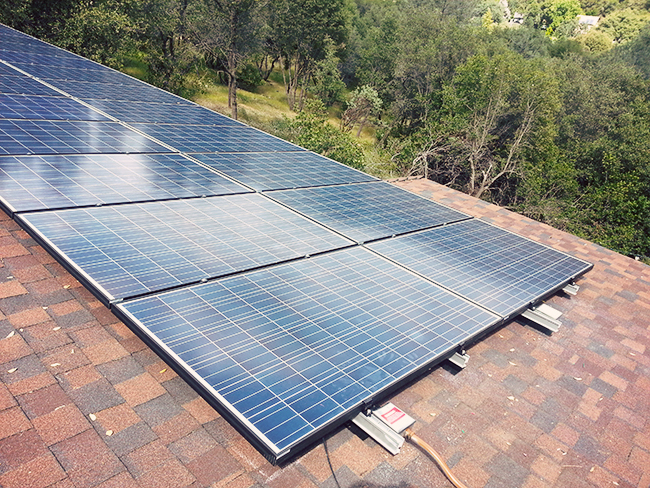 After 20 years you own the solar panels—still at no cost to you. You have the option to buy them before that time, although that’s not something that we’d want to do, and they’re under warranty for 25 years. The only catch is not everyone will qualify. At least part of your roof has to face south or west and have exposure to the sun, and you need a 700 or higher credit score (for liability). Before the process begins, they send someone out to do a site survey to evaluate your situation, and if it will work, they’ll submit a proposal for permits. They’ll even take care of cutting down branches/trees that are in the way if it helps them to be more effective (though I’m not sure to what extent). A few weeks or so later after you’re approved, you schedule your installation and it takes about a week (at least in our case). 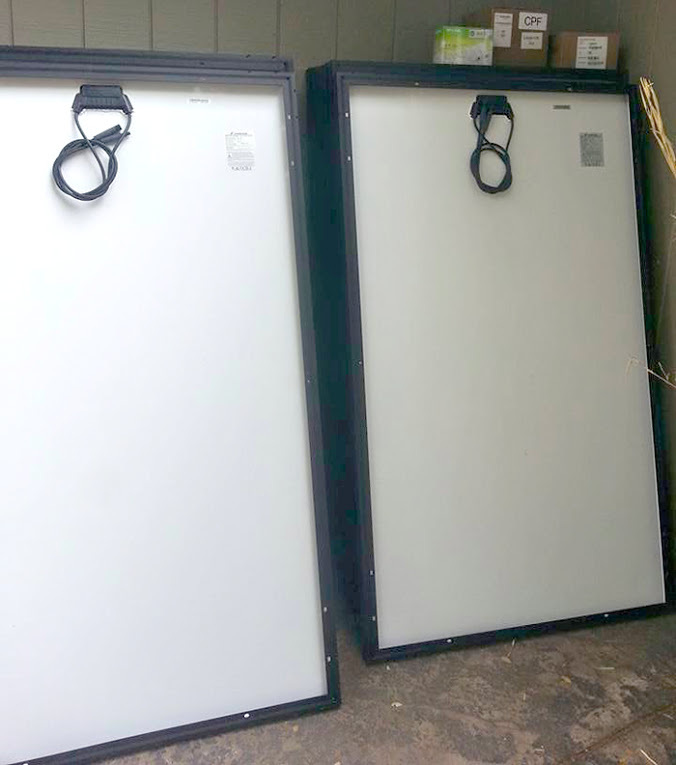 Since we are still paying PG&E we aren’t off the grid—you’d have to be on batteries to store the extra power (or a generator or both) for that. But we’re excited to find out how much our bill will drop each month. Before this we were averaging around $175/mo (but as high as $300+ some months)—our house is 100% electric so we should see a decent savings. They estimated $40k over the life of the panels to give you an idea. Fortunately for us, you can’t see the panels at all from the house—neither from the front nor the back deck—you have to be on the roof. 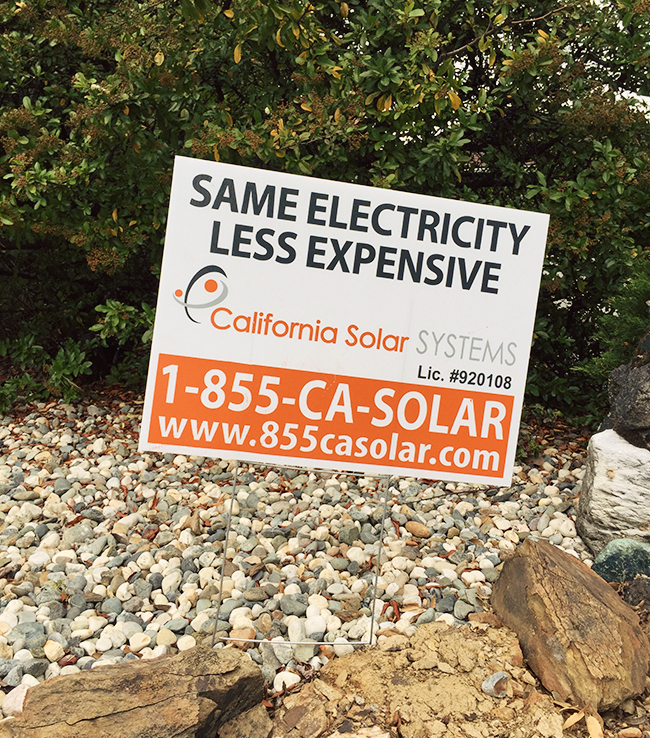 The company we used is California Solar and, as you can guess, they operate here in California. There are similar programs in other states so I’d definitely recommend looking into it wherever you are—I haven’t been able to find a downside yet. If you need more time to think about it, feel free to reach out in a few months or so and I’ll let you know how things are going and how much we’ve saved. One cool thing is that you can monitor your output online (or on a phone app). 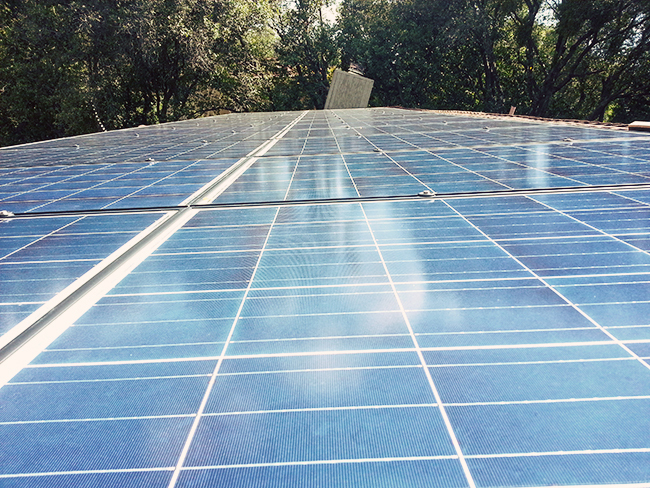 This was taken from yesterday after they turned it on (it was cloudy all day but still produced 4.5kw in 3 hours. Pretty neat to watch (especially for Brad, he gets excited). They do have a referral program (we were happy to refer our friend whose first told us about this) so if you call, please be nice and tell them Jenna Sue sent you 😉 And then you can tell your neighbors and friends and we can all earn some money and be green together! Woo! Before I go, I just had to share a few exciting things that happened in the last week! 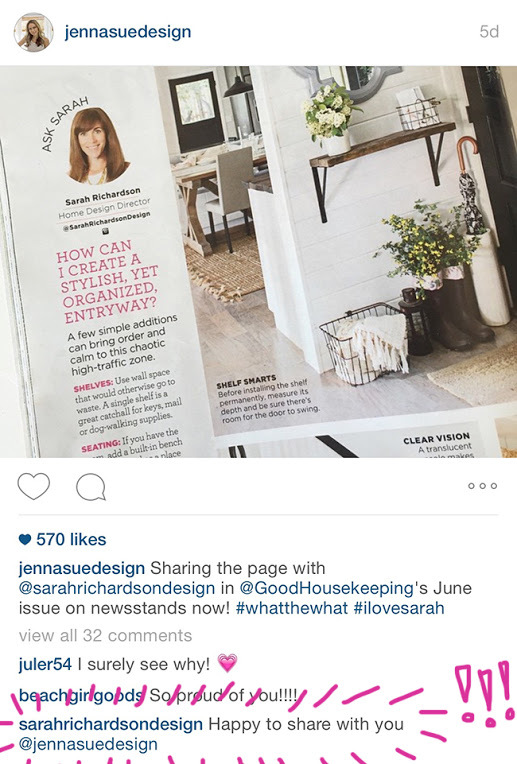 Our foyer is in the June issue of Good Housekeeping… remember this photo from our Spring Tour? She totally replied. #fangirl moment. 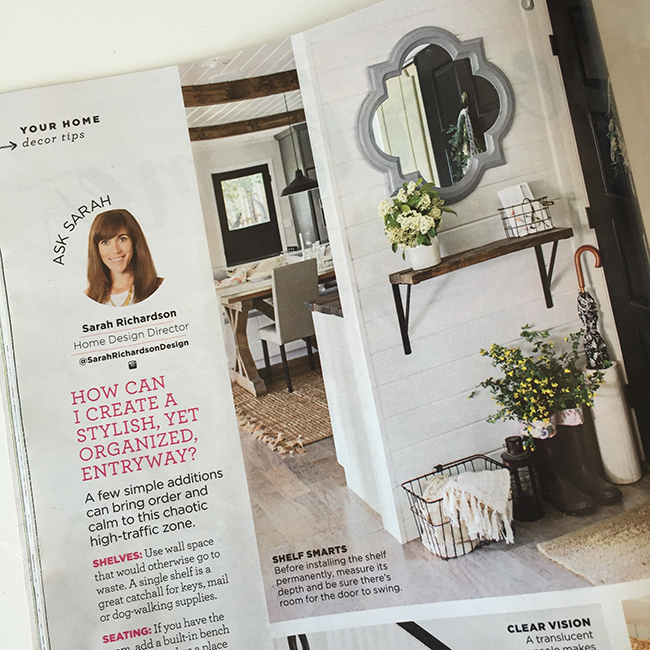 The same day that issue came out, Country Living gave the biggest compliment when they called our bathroom “One of the Most Beautiful DIY Bathroom Renovations Ever“… I mean… what?! Craziness. A few days later House Beautiful picked up the article and shared it on their site. So between that and the overwhelming number of heartwarming survey responses I received, this week has been extremely humbling for me, so as always… THANK YOU. I’m Canadian and Sarah is my #1 designer. I would have been ecstatic for her to not only respond to my post but also choose that photo for the magazine. You rock! You’re also high on my list of favorite designers and over the summer DH and I are redoing our bedroom with yours as our inspiration. Love the new site. Love your bathroom tile. Keep up the awesome work!